KANSAS CITY, Kan. — Catholics across the Archdiocese of Kansas City in Kansas can look forward to getting a late Christmas present: new goals for the mutually shared vision. After an intensive research process in early 2015, Archbishop Joseph F. Naumann and an 11-member Envisioning Leadership Team produced a bold pastoral plan for the life of the church in northeast Kansas for the coming decade. This plan, called the mutually shared vision, was put into effect in August 2015. The implementation parts of the mutually shared vision were the three key initiatives (also known as “super priorities”). Under each key initiative were two or three goals. “[The envisioning team] has determined that we have completed all the goals we initially set out to achieve,” said Steve Ehart, archdiocesan consultant for mission strategy. To date, more than 20 parishes have been or are now in a pilot process for using evangelization benchmarks, said Deacon Dana Nearmyer, archdiocesan evangelization division secretary. Equip individuals to be agents of evangelization through ongoing one-on-one discipleship, small gatherings and large group formation by offering missionary discipleship training, called “The Movement of the Holy Family,” through Pentecost 2018. Continue to focus on parish evangelization benchmarks by offering customized resources, best practices and planning support to accompany individual pastors and parishes from various regions by Pentecost 2018. Accelerate a cultural shift to missionary discipleship by focusing on scriptural engagement, intentional prayer and accompaniment in the peripheries through archdiocesan-sponsored events and convocation experiences in 2019. “The new goals for ‘Building a Culture of Evangelization Across the Archdiocese’ are the natural fruit of the first goals,” said Father Andrew Strobl, who leads implementation of this key initiative as a member of the envisioning team. 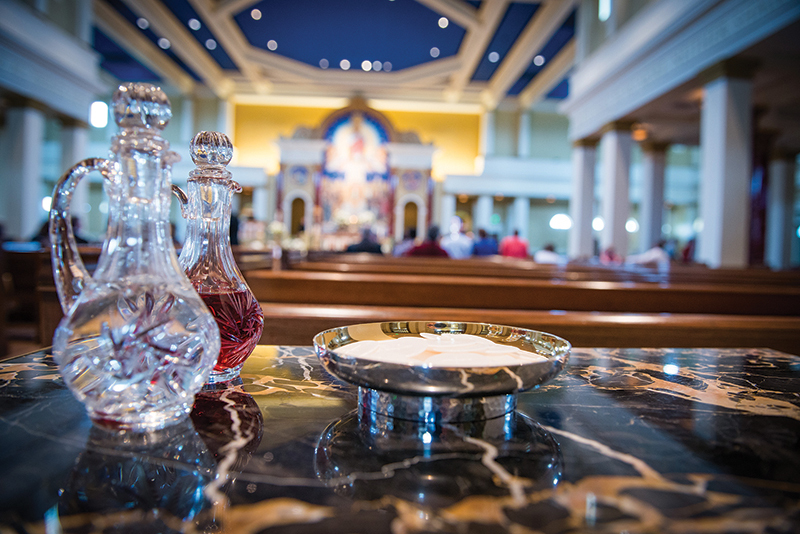 Building on the evangelization benchmarks and pilot parish initiative, the evangelization division continues to offer consultation, resources and planning support to parishes. “Recently, seven more parishes have embraced the opportunity to be more intentional about their work in evangelization through individual consultation with the office of evangelization,” said Father Strobl. “In addition, more events are being planned to foster better scriptural engagement, intentional prayer, and accompaniment in the work of evangelization,” he said. The original two goals under this second key initiative were: first, to summon and equip couples to participate in a marriage enrichment activity; and second, to devise a strategy for equipping parents to be primary teachers of the faith. The program used by the archdiocesan marriage and family life office to meet these goals was the Joyful Marriage Project, said Deacon Tony Zimmerman, lead consultant of that office. The project offered a variety of enrichment opportunities. “There were events that were weekend retreats, enrichments that happened over a Saturday morning and enrichments online,” said Deacon Zimmerman. “We were trying to offer a full stable of different opportunities to meet the different needs of people to enrich their marriage. The marriage and family life office also took their message “out into the marketplace” with 30-second radio spots that played in October and November. The new goals under this key initiative include increasing participation in the Joyful Marriage Project through advertising, promotions and outreach to Hispanic couples. Summon and equip couples to better live the heroic call to Christian marriage by focusing marriage enrichment invitations through the Joyful Marriage Project campaign, while increasing participation through advertising and promotion, creation of new offerings and a new outreach to Spanish-speaking couples by June 30, 2018. Implement the “Sacramental Moments” strategy for equipping parents to be the primary teachers of the faith by completing and distributing all approved materials and supplying the appropriate directions for their use by November. The aforementioned goal will be reached, in part, by a new video that lays out a vision for parents to take up their role as the primary teachers of the faith to their children beginning at baptism, said Deacon Zimmerman. The goals under this key initiative were substantially, although not totally, met. As part of the first goal, parishes invited persons to make commitments to regularly engage in one or more corporal or spiritual works of mercy during the jubilee Year of Mercy. As part of the second, each parish or parish cluster was to partner with other parishes or organizations to better encounter Christ by Easter 2016. “Our first goal of inviting parishes and families to make commitments to regularly engage in the corporal and spiritual works of mercy was met,” said Ken Williams, president and CEO of Catholic Charities of Northeast Kansas. Parishes, priests and other ministry groups shared their experiences and encouraging examples of their works of mercy. In order to grow as companions in faith, by Advent 2020, all parishes within the archdiocese will have entered into an intentional partnership with at least one other parish to engage in projects of mercy and support in order to better encounter Christ in one another. For parishes that are currently twinned, a climate of collaboration will be fostered through coaching and sharing of best practices. By the First Sunday of Advent 2019, each parish, alone or in collaboration with other parishes, will commence outreach that is inclusive and supportive of parishioners with disabilities, beginning with participation in faith formation programs (including sacramental preparation) and participation in the liturgy.